Urbana’s Austin Rooney (3) works around his defender on Friday night against visiting Ben Logan. 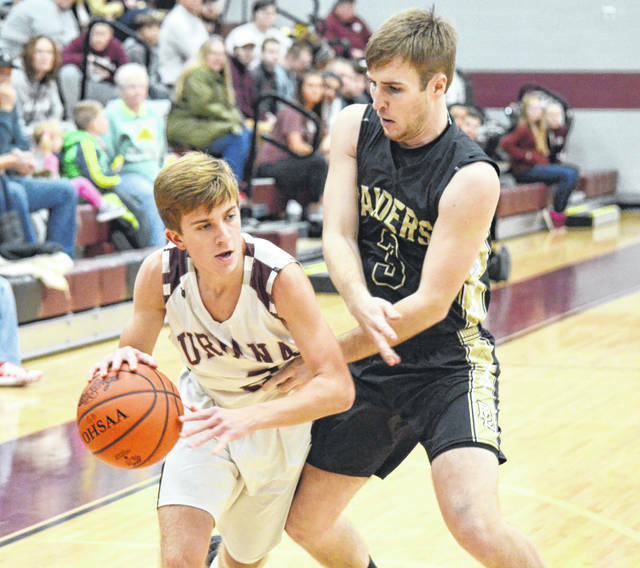 Urbana and Benjamin Logan battled for first place in the Central Buckeye Conference’s Mad River Division on Friday, with the visiting Raiders coming away with a 41-36 victory to hold their place in the driver’s seat. The win widened the gap in the MRD to two games. Both teams came out with swarming defense – the Raiders in the half court and Urbana in the full court. Turnovers marred the first quarter, which saw the Hillclimbers take an 8-5 lead. The ’Climbers (6-4, 3-2) pushed the lead out even further in the second, but the Raiders (9-3, 5-0) closed the half with a nice run of offense and took an 18-17 lead on a three-pointer with less than five seconds left. “The difference was we kept giving them the ball. We had 23 turnovers, including 15 in the first half,” UHS Coach Jeremy Dixon said. The struggle continued in the latter stages of the game, when Urbana was able to cut the lead to a couple of possessions and even trimmed it to a three-point margin with a minute to go. Reid Taylor scored 13 points and Isaiah Fonseca added 11 to provide most of the offense for Urbana. It was a struggle all the way around on the offensive end. In the jayvee contest, Ben Logan won, 53-44. Nolan Smith scored 11 points and Izaiah Underwood had 10 for Urbana. In the freshman game, Urbana won, 39-33. Max Keely had 14 points in that one for UHS. Urbana hosts Shawnee on Tuesday. https://www.urbanacitizen.com/wp-content/uploads/sites/36/2019/01/web1_AustinRooney011119_ne2019111204332516.jpgUrbana’s Austin Rooney (3) works around his defender on Friday night against visiting Ben Logan.